Maracujá Oil comes from the Passiflora Incarnata, a vine native to the Amazon. The Spanish named the fruit ‘granadilla’ meaning ‘little pomegranate’ when they discovered the plant over 400 years ago and took it back to Europe. This creeper produces exquisite, intricate and sweet scented flowers which are said to represent aspects of the Christian crucifixion story, so garnered the name passion flower. The round fruit is roughly the size of an egg and wrinkles when ripe. It is packed with black seeds suspended in a slightly tart, sweet yellow pulp that can be scraped out and eaten with a spoon. The seeds are cold pressed to obtain a light, bright yellow oil with a faint citrusy smell, reminiscent of grapefruit. There are over 500 species of passion flower but the purple passion fruit, Passiflora edulis, is said to produce the finest oil. Used by the Incas and Aztecs for pain relief and as a herbal sedative, Passion flower has a long history of medicinal use. It was also eaten as a nutritious fruit, being high in vitamin C and minerals. 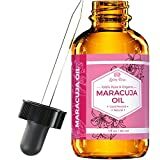 Maracuja Oil is rich in fatty acids and essential fatty acids – the major constitiunt is linoleic acid (Omega-6), followed by oleic, palmitic, stearic and linolenic acids. It also contains linalool, carvone, euganol and some 140 other componenets, including vitamins C and A, calcium, phosphorous, potassium and iron. Despite the name, Passion Flower’s main claim to fame is as a non addictive, herbal sedative, drunk as a tea or taken as an extract. The same calming effects are afforded by the oil to skin. Rich in antioxidants, Maracujá Oil is anti-inflammatory, analgesic, anti-spasmodic and soothing. The fatty acids nourish and soften skin, improve its elasticity and help it retain moisture. It brightens and plumps skin, evening the tone and texture. The fine consistency of Maracujá Oil feels light and silky and it absorbs effortlessly whilst providing antibacterial and healing potential. It is hydrating and non clogging. Maracujá Oil can be ingested for its calming abilities and as an antihistamine for reducing symptoms of asthma and respiratory tract infections. It also has anti-spasmodic actions so it is useful for coughs, whooping coughs, bronchitis, muscle aches and spasms. In Brazilian traditional medicine, it is used to treat nervous disorders like depression, restlessness, panic attacks, anxiety, insomnia, headaches and tension, as well as urinary tract infections, low libido and gastrointestinal issues that are related to anxiety. Maracujá Oil is perfect for inclusion in massage and bath care products because of its relaxing and sedative qualities. It is particularly good for easing muscle aches and stress. Topically, it is suitable for all skin types, even oily skin and especially dry, cracked skin and for mature, ageing skin as a protective and nourishing ingredient. It is good for age spots, wrinkles, pigmentation marks, pimples and uneven skin tone. It is also great for dry, brittle and damaged hair and flaky scalps. Taken internally, it is good for any problems related to anxiety and nerves. Mix oils together and use it to moisturize sensitive skin, especially if it is oily too. This blend will soothe and protect as well as balance oil production.